Easy snow reporting in the cloud. The idea behind Report pal is a simple one - move snow reporting away from your website CMS and into the cloud. Instead of controlling your snow report from your website (which can change every couple of years, resulting in more costs to build, time re-training staff and having to re-integrate with 3rd parties), move it into the cloud and have a consistent platform, season after season. Report Pal makes use of the latest technologies on offer from Amazon Web Services, giving you a rock solid, always on snow reporting platform that's lightning fast. 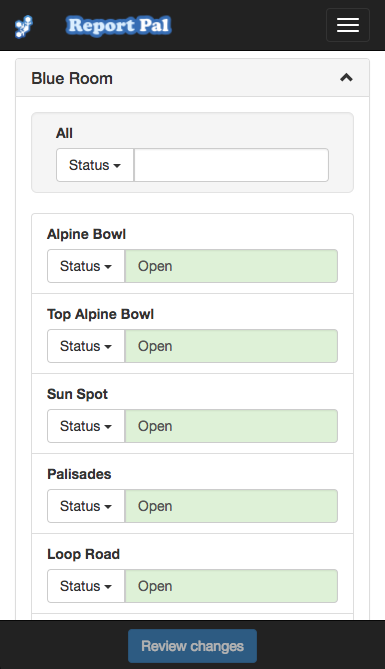 Every ski resort is different, so Report Pal has been built from the ground up so that we can customise it to suit you. No more working your way around limitations of your website CMS, you can input and output what you like. We'll setup your output in MTN.XML format - the industry standard. Your data will be easily shared with 3rd parties.